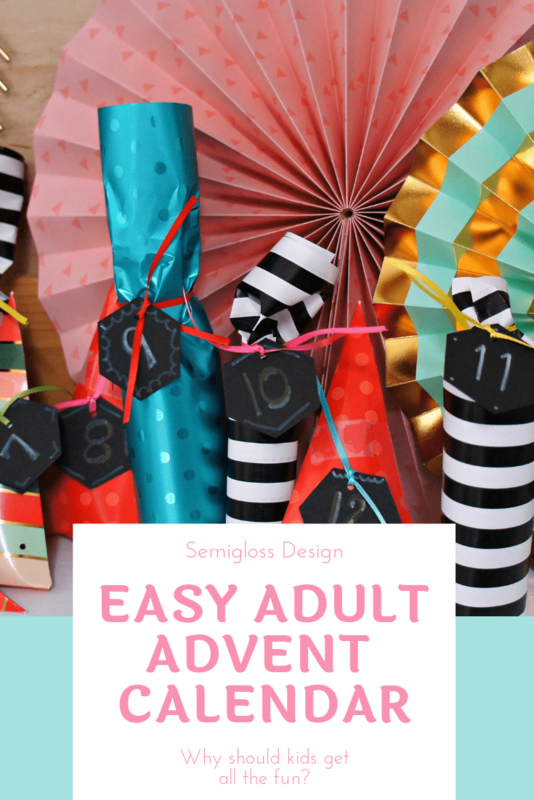 Learn how to make an adult advent calendar! If you like Christmas crafts, you might also like this Christmas stocking tutorial or these printable gift tags. Ever since my son was a little guy, I’ve bought my kids advent calendars. They used to be into Playmobile so I bought those for a while, before eventually moving to Lego. It seems like they are growing out of that stage, which is bitter sweet. This year, I’ll probably just get them candy advent calendars. But who says that kids should get all of the fun of an advent calendar? I made an adult advent calendar for my husband and myself to join in on the fun! Wrap each item. 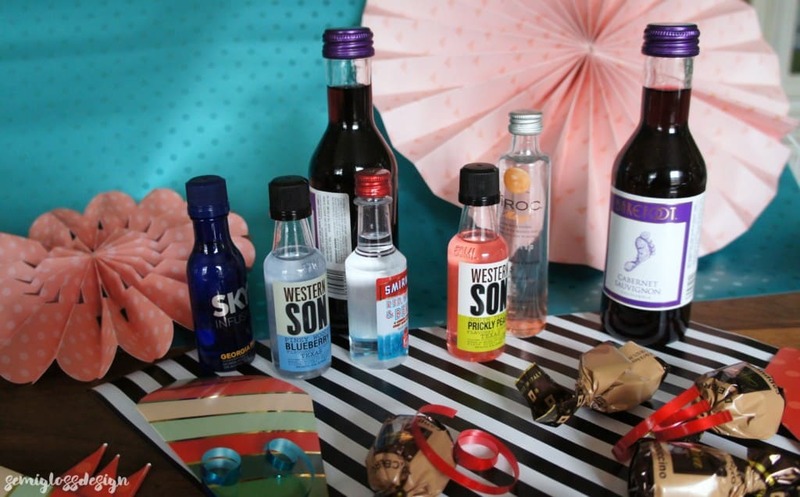 The bottles were wrapped using a method that reminds me of candy. Basically, you roll it in the paper until it’s covered. The bottom, you carefully smush up fold neatly and tape. The top gets tied with a ribbon. The candies got shoved in goody bags. I tried to find similar ones, but since I bought them at Home Goods, they’re impossible to source. Here’s a tutorial on how to make them, though. Then I attached the numbers with ribbon to the packages. I tried to space out the liquor bottles to the weekends, because that’s when I prefer to drink. 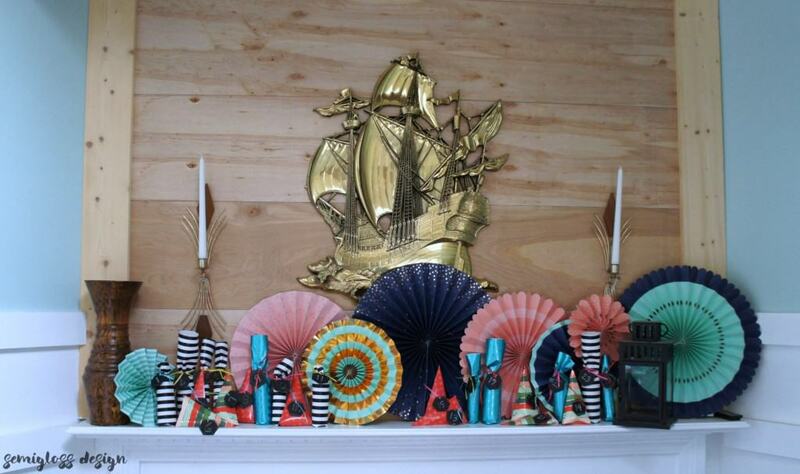 Then I lined them up on the mantle in a festive display. They’re not quite in order because I wrapped a few with the same paper and they looked better apart. 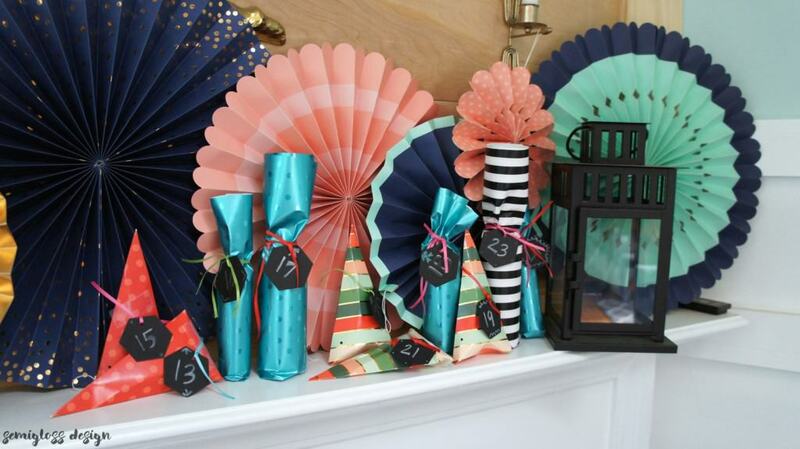 The paper fans were bought at Home Goods, but you can find them here in a different color. 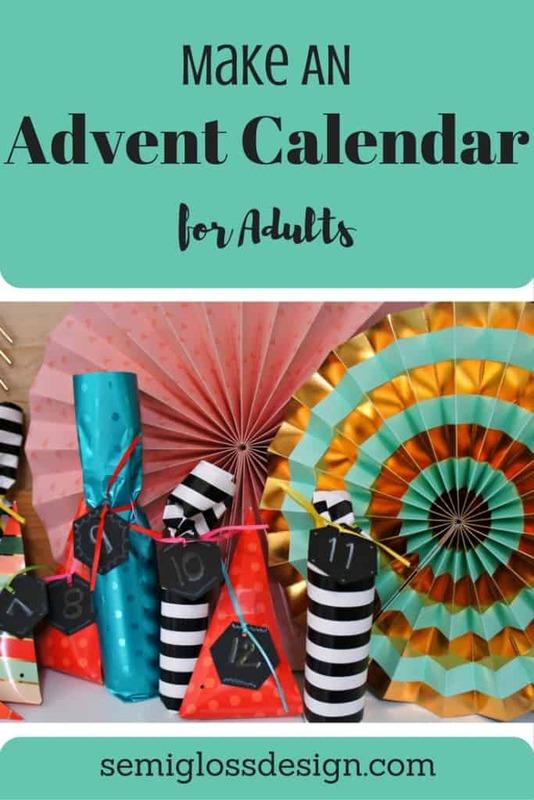 What would you put in an adult advent calendar? 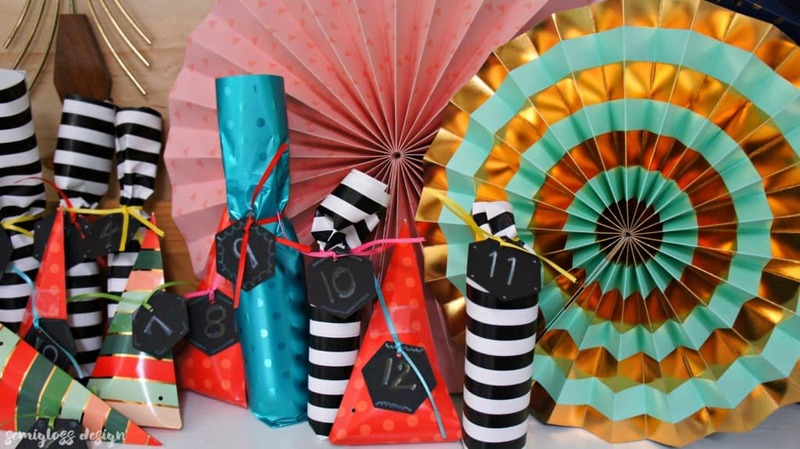 now that is a fun advent calendar!!! Thanks Ariel! 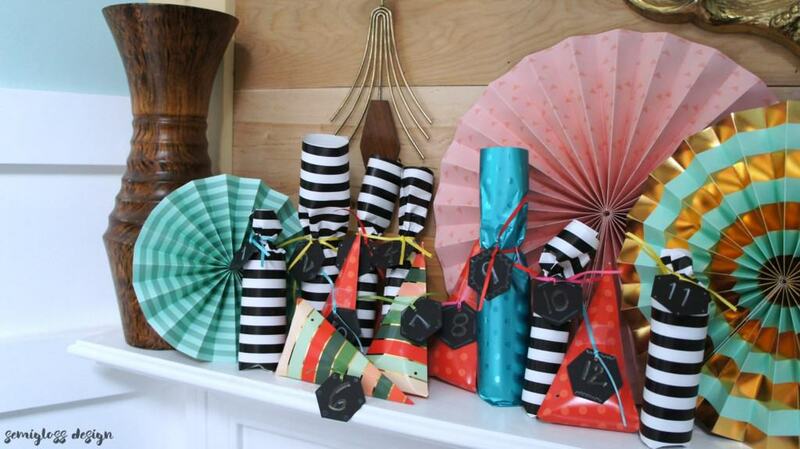 I might be a wrapping paper addict. There are so many pretty patterns!